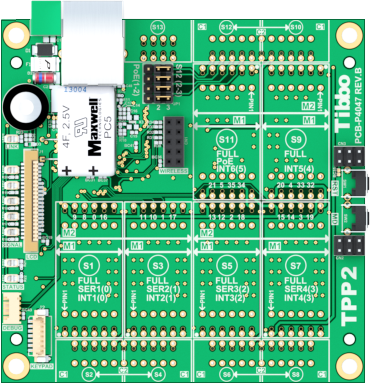 Size 2 Tibbo Project PCB (TPP2) runs Tibbo OS and is programmable in Tibbo BASIC and Tibbo C.
TPP2 is perfect for systems with a medium number of I/O lines. The board can optionally control a TFT display and a keypad, so it is suitable for applications requiring a human-machine interface (HMI). This product can be used as a bare board or assembled into a size 2 Tibbo Project Box. For HMI applications, the board can also be assembled into the TPB2L box, which features a 320x240 TFT LCD and a 4-button sensor keypad. Featuring 3 tiles for a total of 6 "M" and 6 "C" sockets, the TPP2 can implement configurations with up to four simple serial ports, up to 12 relays, or up to 24 opto-inputs, PWM, or open-collector outputs. The TPP2 is perfect for data collection and AutoID projects, as well as factory, shop, data center, hotel, and home automation applications. The board contains enough "C" sockets to simultaneously accommodate temperature, humidity, pressure, ambient light, and shock sensors. With the use of appropriate Tibbits the board can even control legacy IR devices by emulating traditional IR remote controls. •Connectors for the TFT LCD and sensor keypad of the TPB2L. •22KB SRAM for Tibbo BASIC/C variables and data. •1MB flash memory for TiOS, application code, and file system. •Software-controlled PLL for selecting high or low speed. •Power: 220mA @ 3.3V (100Base-T mode, full speed). •Dimensions (LxW): 94 x 94mm. •Firmware is upgradeable through the serial port or network.